Here's a challenge I think is simple, achievable, and one that encourages creativity. The Global Cardboard Challenge invites kids from anywhere in the world to design and build things out of cardboard. In September, participating children are encouraged to start the design/build process. Then, on October 5, there's a Global Day of Play. I love that this challenge uses a material (cardboard) that is readily accessible. It encourages kids to put their own spin on constructions, it subtly emphasises re-cycling and it encourages creativity and problem-solving. Parents might organise a group of kids in a neighbourhood, teachers might issue a challenge to other classes, the library might (gulp) be used to display the final creations. To find out more about the challenge, check out the Imagination Foundation's website. You can watch some videos about last year's events, and register to be involved this year. If your kids are interested in learning about how to work with cardboard, folding, bending, cutting etc, there's a great tutorial on ikatbag. If you're thinking about how to display individual buildings your children make, consider assembling a vertical cardboard city similar to the one described at whip up. 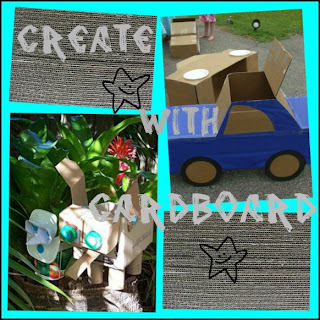 You could check out some cardboard artists with your kids. One of the projects my students adored was to create a cardboard marble run. Here's a Pinterest board with possible inspiration called Cardboard Box Creations, and another set of Pinterest boards belonging to Cardboard Dad (thanks Trish! ), but I'm pretty sure your kids will be bursting with ideas and enthusiasm for this great project.